Kickstart your morning with exotic flavours. We have upgraded the classic combination of banana and strawberry smoothies by adding the extraordinary acerola. Acerola, also called the Barbados cherry, grows across the Caribbean, Central America and northern parts of South America. Its fruits are loaded with antioxidants, they help mitigate fatigue, and contain even more vitamin C than lemons. To wrap it all up with even more deliciousness, we added some grapes, apples, oranges, black currant and a few drops of lime. 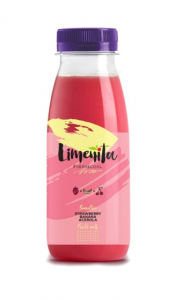 Limeñita smoothies are made purely with fresh fruits, no added water, sugar and preservatives. Thanks to constant cooling they maintain their great taste and freshness. You can find them in the fridge of every good supermarket.